The first entry in Alexander Howell's 'Notes on the Topography of Portsmouth' published in 1913, was "Albert Street (Landport)". He went on to say that it "...formed what is now the western end of Sultan Road. It extended from Commercial Road, eastwards as far as Prince's Place. It was built on the Middle Furlong of Cherry Garden Field." This brief entry recalls a street that existed for just a few years and would otherwise be quite forgotten by the 21C. Albert Street was just one road of many carved out of an early common field around the middle of the 19C at a time of huge expansion of the Borough of Portsmouth. It had no great significance other than that surviving records make it possible to trace the development and demise of the street in some detail. The name itself first appears on the tithe map drawn by Thomas Ellis Owen which showed the Portsea Parish of 1845 in extraordinary detail. 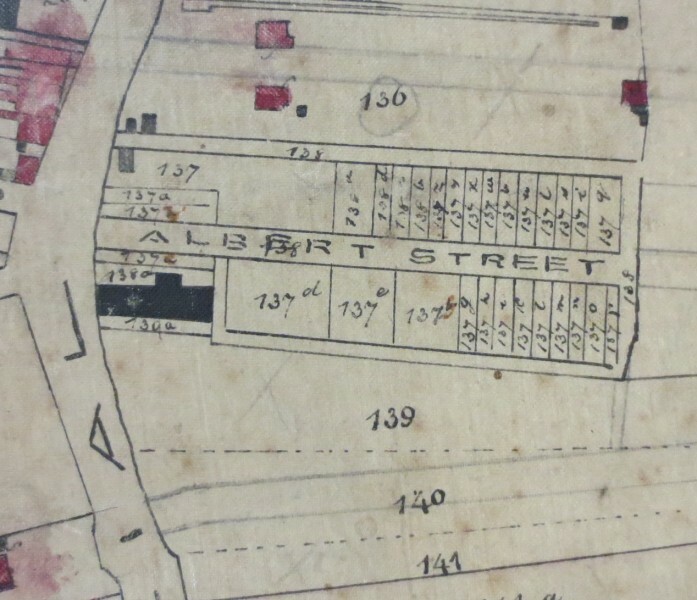 It listed every parcel of land according to it's owner and the name of the person who rented it, though, in the case of Albert Street (see right), and a few other roads, a few adjacent strips had been subdivided prior to housing development work. The expansion in the size of the borough at this time was in response to the realisation by the government that Britain was falling behind other nations in the size and modernity of it's fleet, particularly in relation to the service and repair of steam vessels. In 1843 the first stones of the new Steam Basin in the Dockyard were placed and over the next five years millions of cubic feet of brick and stone were laid. Albert Street was situated conveniently close to the dockyard so it would not be unreasonable to suppose that the houses being built there would be largely occupied by dockyard workers. The detail of the map on the right shows Albert Street with Commercial Road running vertically on the left. Prior to the Owen Tithe Map the only other map we have that shows the same area in detail was drawn around 1800 (see left). Because of the orientation of this map we have shown it upside down, with north pointing downwards. This allows the text to be read with ease. It is nevertheless simple to see the distinctive bend in Commercial Road which marked the western end of Albert Street. Although the map does not offer definitive information about the owner of the land at the time it does illustrate some factors common to the piecemeal development prevalent at the time. In particular, we might note that Albert street was quite short and the reason is clear from the map - the strips on which it was built were themselves short, terminating in another set of strips set at right angles to them. Perhaps the most obvious common feature of the 1800 and 1845 maps is the building standing at the Commercial Road end of Albert Street. Although there is little information about it's origins we do know that by the turn of the century it was owned by the grocer William Pink. Kelly's suggests that it was No. 436 Commercial Road and that it was also known as Winchester Buildings which comes as no surprise as the land on which it was built was at the time probably owned by Winchester College. 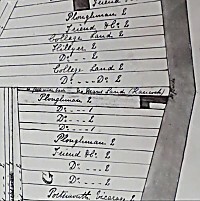 The 1800 map confirms that the two strips to the south were indeed owned by the College and whilst the nearest strips to the north were being worked by a 'Ploughman' he wouldn't have owned the land. Further evidence of the exact positioning of Albert Street can be shown by looking at the piece of land immediately to the south of Winchester Building. The 1800 map describes it as "No Man's Land" (tapering from 4ft to 35ft in width) but adds the name of "Hancock" in brackets. The tithe map and schedule tell us that at least part of it corresponded to the No. 139a holding (see map above) which was owned by the Corporation but rented by "Mrs. Hancock". This narrow plot was later modified and became a road to the rear of the houses on the southern side of Albert Street. 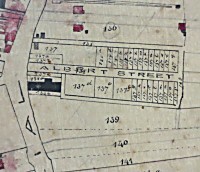 At the time the Tithe Map was prepared the land which formed Albert Street had already been bought by the prospective developers who were listed in the Schedule to the map as shown on the right. The plot numbers can be seen on the Tithe Map detail above. It had been hoped that this list would show a network of local developers but none of the major purchasers can be traced to a residence in Portsea at the time of the 1841 or 1851 censuses. It would have been interesting to find out how Henry Seymour Collings and William Horner managed to purchase so many alternate plots but we can at least see that they were wise enough to buy the road network around the development (plot 138) as well as the building plots. 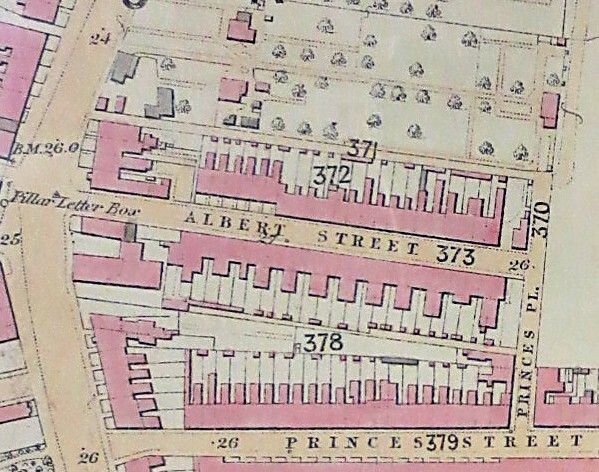 The Tithe Map tells us that all the building plots on Albert Street had been sold off by 1845 but we do not know exactly when the first houses were completed and occupied. We do know that Albert Street did not appear in the Register of Electors before 1847 but in that year two names were registered against property there - William Young (a barge owner at No. 2) and John Gawne (no details available). A year later, 7 electors declared their residence to be in Albert Street, Robert Gray (RN Gunner at No. 16), Henry Kimber (Dockyard painter at No. 37), Henry Love, Jacob Ludlow and Thomas Ludlow in addition to William Young and John Gawne. By the time of the census on 30th March 1851, 37 of the possible 42 houses were inhabited. Of the male Heads of Household listed 8 appeared in the lists of electors compiled in October 1850 and 15 appeared in the corresponding list for 1851. Given that all of the houses built in Albert street at this time were of a similar size and that some of them had to have been worth at least £10 per annum (in order for the occupier to appear on the electors lists) then all of them should have been similarly valued and so confer voter's rights on the occupants. It might seem surprising therefore that so many households did not qualify for a vote. There are a number of reasons for this. The evidence suggests that there was a lot of movement between houses at this time with many people spending less than a year in any one house and as a consequence they may not have had time to register at their address in Albert Street. In addition, the householder may have moved into Portsmouth to find work and would probably not have satisfied the three year residency qualification to become a Burgess. (11 possible instances). A number of the men were serving in the Royal Navy and were not at home when the censuses were held and therefore may not have been resident at the time of the compilation of the electors lists either (5 instances). The head of the household was female (6 instances). The 1851 census gives a clear indication that Albert Street was designed for and occupied by working class tenants, several of whom would probably have had aspirations of rising higher. Every household seems to have had a reliable income with up to 24 heads of household working in the Dockyard or Royal Navy. Only 8 households contained no one in full time employment, but of these 5 were 'Annuitants', one was a Greenwich Pensioner and only one was on 'Parochial Aid'. The rest were employed as tailors, boot makers, fishermen etc. 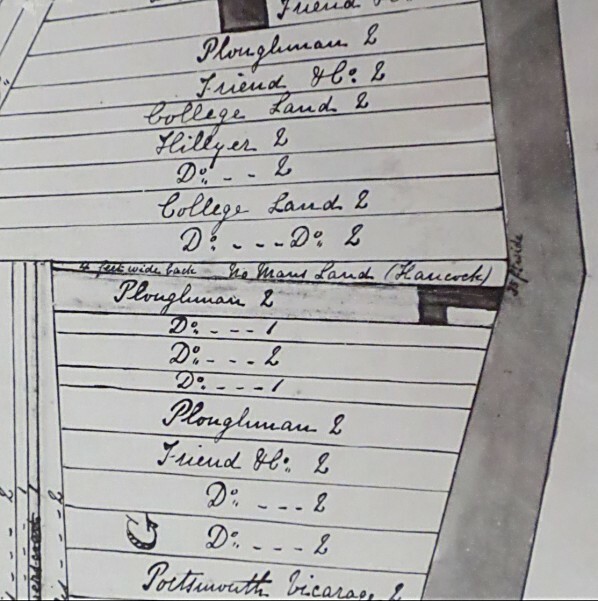 By 1861, the census returns were showing the road again largely occupied by persons associated with the dockyard, with 12 heads of household being members of the Royal Navy, 13 employed in the dockyard and 6 pensioners and widows connected to the navy. Only three residents from 1851 were still in place 10 years later giving further evidence of the continuous turnover of occupants. A further 10 houses had been added to Albert Street over that decade and it seems likely that the house numbering system was changed from continuous to odds on one side of the road and evens the other. The final configuration of the houses can be seen on the map from a little later in the 1860s (see left). Over the next 30 years the pattern of occupation of Albert Street remained much the same though the number of occupants associated with the Dockyard would rise and fall in common with the fortunes of the dockyard itself. 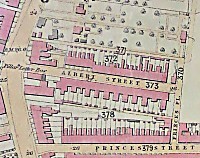 By around 1890 almost all of the former Cherry Garden Field had been turned over to house building which meant that Albert Street was surrounded by fully developed streets. Of most relevant was perhaps Sultan road which bisected the entire field from east to west, terminating at the eastern end of Albert Street. It was only a matter of time before the dominant road devoured the shorter. The 1891 census was the last to list any residents of Albert Street and even then only 8 houses seemed to be occupied under that name plus a further 7 in Albert Terrace and 8 in Albert Place. It hasn't proved possible to determine exactly where the Terrace and Place were but they were both listed as being on Albert Street. 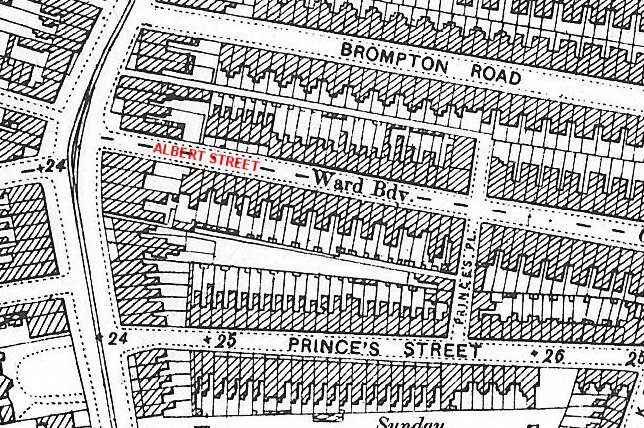 By the 1901 census all trace of Albert Street had been consumed by Sultan Road (see right) but it quite clear that the pattern of houses remained almost exactly the same. This part of Sultan Road probably remained much the same for the next 70 years, until the town planners removed all the houses to make way for a modern housing development. Various maps, census returns and Electors lists.